Julio Morban homered for the first time since June 22nd last night. 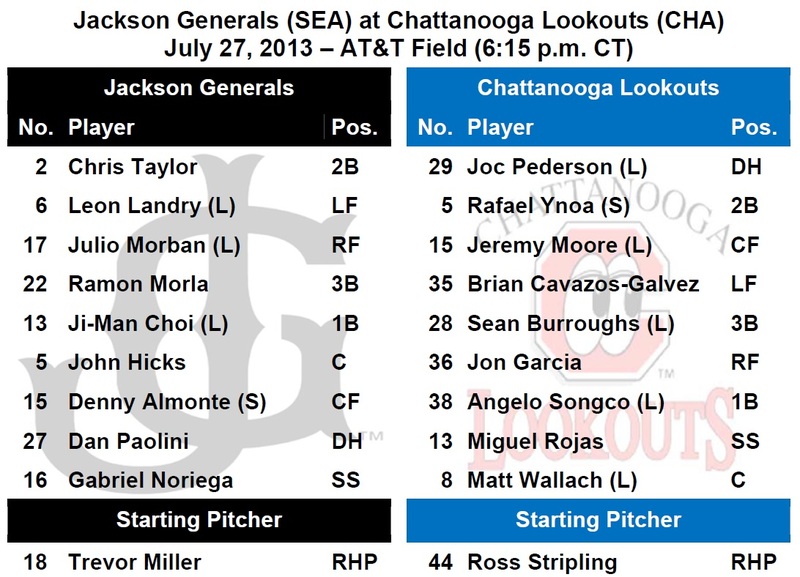 TODAY’S GAME: the Generals wrap up a 5-game road series tonight with game #5 at AT&T Field against the Chattanooga Lookouts…the Generals have won 4 of 5 in a series only once this season (July 4-8 at Pensacola)…the Generals are 8-6 against the Lookouts this season and 6-3 at AT&T Field…22-year-old RHP Trevor Miller makes his 2nd Double-A start tonight in the final game of the series against the Lookouts. Miller was 4-7 with a 4.82 ERA in 18 starts for A+ High Desert this season. GENERALS RECAP: The Generals out-hit the Lookouts 11-7, but it wasn’t enough as Jackson lost to Chattanooga 2-5 on Friday night. CF James Jones (2×4), RF Julio Morban (2×3, 2 R, HR, RBI, BB), 1B Ji-Man Choi (2×4), C John Hicks (2×4, RBI) and DH Daniel Paolini (2×4, 2B) each recorded 2 of the team’s 11 hits. Starter Anthony Vasquez (5.1,4,4,4,2,1,2HR) recorded his lost the loss, allowing 4 runs on 4 hits in 5.1 innings. RH Stephen Shackleford (1.1,1,1,1,1,2) allowed a run in the 7th inning, while LH Nick Hill (0.2,2,0,0,0,0) and RH Carson Smith (0.2,0,0,0,0,0) combined to hold the Lookouts scoreless over the final 1.1 innings. NEWS & NOTES: 37 of first 97 games have been 1-run games (15-22) which is the 7th in all of minors…52 of 97 games have been decided by 2-or-fewer runs (19-33) and 12 have been extra-inning games (4-8)…In games decided by 3+ runs the Generals are 25-19. • ALUMNI REPORT: Seattle catcher Mike Zunino was placed on the 15-day disabled list with a fractured hamate bone in his left hand. He fractured the bone on his RBI single to left field in the second inning of Thursday night’s game vs. the Twins. • SEATTLE GENERALS:…there are currently (6) players on the Seattle Mariners active roster that were members of the 2012 Jackson Generals (INF Nick Franklin, INF Brad Miller C Jesus Sucre (15-day DL), C Mike Zunino (15-day DL) and RHP Yoervis Medina, RHP Stephen Pryor (60-day DL). 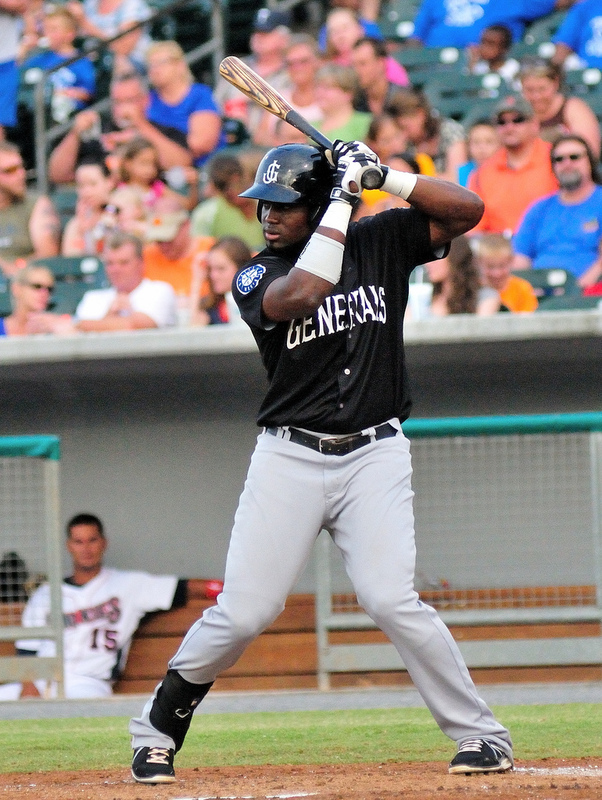 In total, (9) 2012 Generals have made their MLB debuts and (4) 2013 Generals. (C Brandon Bantz, RHP Hector Noesi, INF Brad Miller, RHP Erasmo Ramirez). • ALL ABOUT THE JI-MAN: INF Ji-Man Choi is batting .471 (8×17) with 2 runs scored, 4 extra-base hits (2-2B, 3B, HR), 1 RBI and 1 walk in last 4 games. • BIG YEAR IN BULLPEN FOR HUNTER: LH Kyle Hunter has held oppoents scoreless in 22 of 26 relief appearances this season. Overall he is 1-0 with 1 save and a 1.13 ERA (5 ER, 40.0 IP). He has limited opponents to a .207 (30×145), while walking 8 and striking out 27. • SWEET HOME CHATTANOOGA: The Generals are 6-3 at AT&T Field this season and 25-12 since 2010 on the road in Chattanooga.